A creative agency that embodies change and independence. 01. Discussion Converse and familiarize ourselves with details pertinent to the project. Review and summarize findings. 02. Creative Concept Define brand elements. Define positioning. Compose creative brief to a point of execution. 03. Production Submission of creative drafts for review before final application to the preferred medium/s. 04. Happy Client Enjoy a cup of coffee and further strategize how we can further penetrate the market with our new brand creation. We approach the design and development of any new project through a structured and organised process. The importance of this phase is to intimately develop a thorough understanding of our clients challenges, so we can map out a clear creative strategy for the entire project collaboratively to ensure a cohesive alignment. What the project entails and establish the desired outcomes. With a clear understanding of the client brief, we can define a suitable project plan, meet budgets and timelines. This phase is the backbone of every project. During this phase, we scrutinise your business and your industry, so we can channel all our creative efforts and find common ground and vision going forward. into competing brands, and dissect the current brand perceptions and visuals. Diving head first into a project without proper research or a solid plan is bound to end badly (or at least inefficiently).We steer the ship before it reaches shore by mapping out the bigger picture before you set off on your brand’s journey. Here we lay out our concepts visually before bringing them to reality. The art direction is discussed so we can move forward swiftly and with accuracy. In this phase various elements are proposed from the research gathered to uniquely refine your brand. the presentation of ideas and the next step is to filter through the concepts according to the brand values and principles of the company but most importantly the market trends. 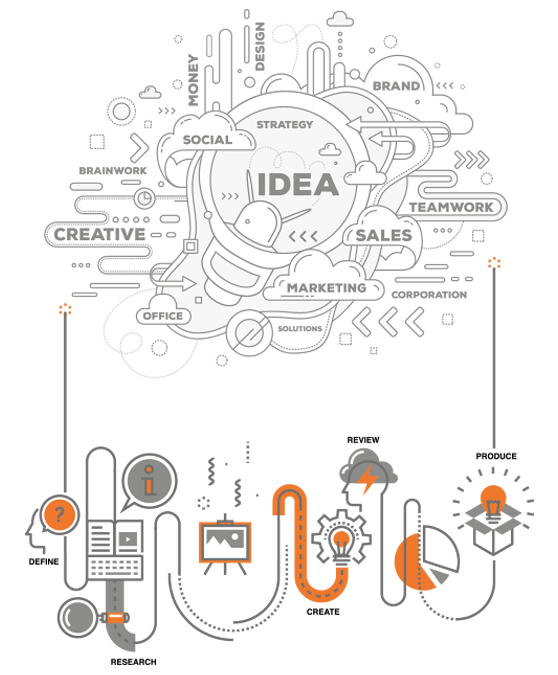 according to the approved art direction, and consistently create collateral in the form of corporate print communication or various branding touch points that will engage your target audience in an iconic and memorable brand experience. A retainer package is an easy way to get full creative support without the hassle of waiting for quotations before the project begins. In this deadline-driven world, time has become the most valuable currency. Enjoy the convenience of having a designer on call.